Daniel needs YOUR help funding Camp Everytown! The entire Building Understanding (BUDS) organization was originally conceived with a single objective about which everything else has grown -- conducting a summer camp for rising high school juniors and seniors that fosters empathy, conflict resolution and leadership skills by exploring the issues of racism, classism, sexism, etc. on a personal basis through powerful exercises and conversations. The reason I threw my entire being into this task, skirting a traditional career track, was because I had first-hand knowledge that this camp could and does work -- I am an alumnus of the former Camp Anytown experience and wholly believe that it played a pivotal role in my development as a person of conscious and action. 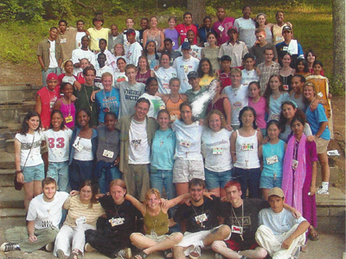 Camp Anytown was run by the National Conference for Communities and Justice in Georgia from 1989-2003 to achieve those exact aims and Camp Everytown, the Building Understanding (BUDS) incarnation, has the same. However, we are not bound by the exact exercises of the original curriculum, but have already begun updating and infusing current flavors and sensibilities so that our BUDS method resonates with today's young people as we evoke the same self-awareness and critical thinking skills. Help me share this exceptional experience with a new generation. I want the leaders of tomorrow to listen and respect others' perspectives and truths. If you do too, please help me by making a contribution. Thank you, thank you, thank you for supporting this powerful summer camp that changed my life, and with your help, will change others! $1,350 has additionally been received via postal mail.